Our basement has been home to my DIY Gift Workshop this year. 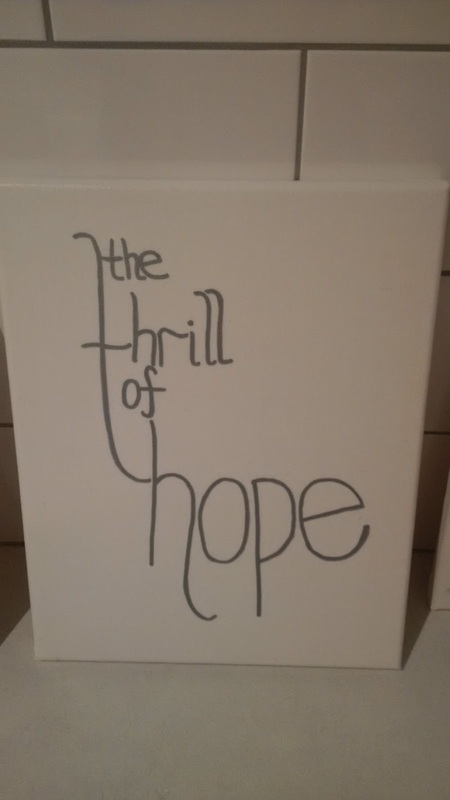 Now that I have finished the personal journals, we have moved on to canvas art. Note: You do not need to be an artist to do canvas art. Let me get this out of the way first - I am very careful about giving people gifts that need to on display. We all have different tastes. Even people who might think they know my taste could always give me some art I would never use (although I would totally appreciate their thoughtfulness). Someone might even give me something I love, but simply have nowhere to put or no use for. With that in mind, if I am giving any art/craft type pieces I like to keep them small in size and seasonal. In other words, nobody is getting a 8 foot by 10 foot abstract multimedia collage from me (also because I would not know how to make it!). A few different pieces came about in my workshop - with different recipients in mind and different methods used. Let's take a walk through them. 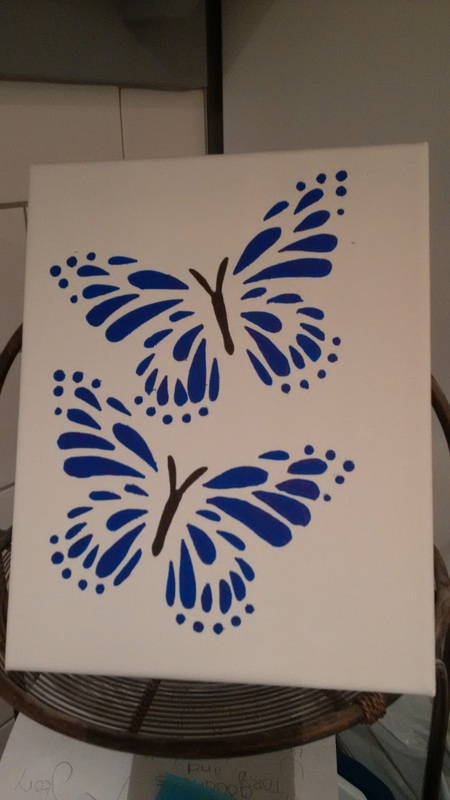 The Butterfly Project is going in with a gift for a young girl. 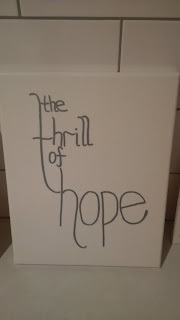 I used an 8x10 canvas (bought in a bulk pack on sale at Michael's). I used the butterfly stencil from Dollorama to stencil on these two butterflies using Blue and Black Sharpies. Sharpies will bleed (just a tiny bit) on to the canvas, so I always retrace after removing the stencil to get rid of any rough edges. 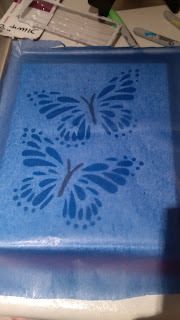 Next, I added this "filter" if you will, using blue tissue paper. I got this idea from Letter Art, by Clare Youngs, where she uses tissue paper to make actual letter art. This is obviously not the same thing, but I really liked how her projects looked and thought I would channel some of that into this project. 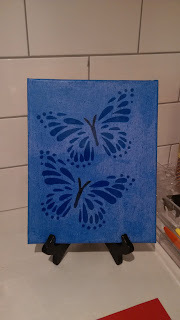 I had a few different colours of tissue paper that I tried, but I preferred the blue filter for this piece. I cut the tissue paper (almost) to size. After this, I put a thin layer of Mod Podge on the canver and began pressing the tissue paper down on top. I used a ruler while doing this to remove as many air bubbles as possible. 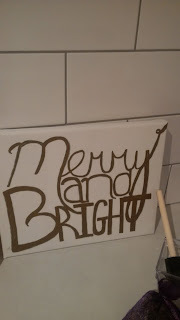 I did this in sections - be careful because you need to make sure the entire canvas has Mod Podge on it or you will get bubbles in it. Avoid using excessive amounts of Mod Podge because tissue paper is quite thin, and if it gets too wet it will tear. Once the Mod Podge underneath dried, I then trimmed the tissue paper even closer to the edges of the canvas, and then added 3 layers of Mod Podge over top. Wait 20 minutes (at least) between each layer. Again, go easy on the Mod Podge because you do not want to soak through the tissue paper. I also have an easel ($2.50 at Dollorama) that will hold the canvas to avoid any holes in the wall. And....voilà! A simple butterfly canvas for a sweet little girl this Christmas. 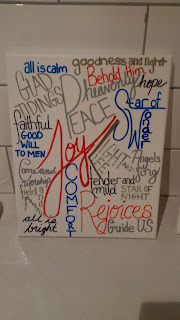 For this canvas I wanted to do a simple excerpt from O Holy Night lyrics. I used a silver metallic Sharpie. Since the script was going to be thin (not wide) I did not do a pencil underlay first. Instead, I drafted multiple ideas and layouts on scrap paper until I found the arrangement I liked. I then copied it (very slowly and very carefully unto the canvas). 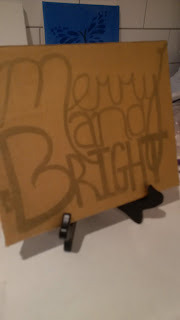 I covered it with 3 thin layers of Mod Podge. 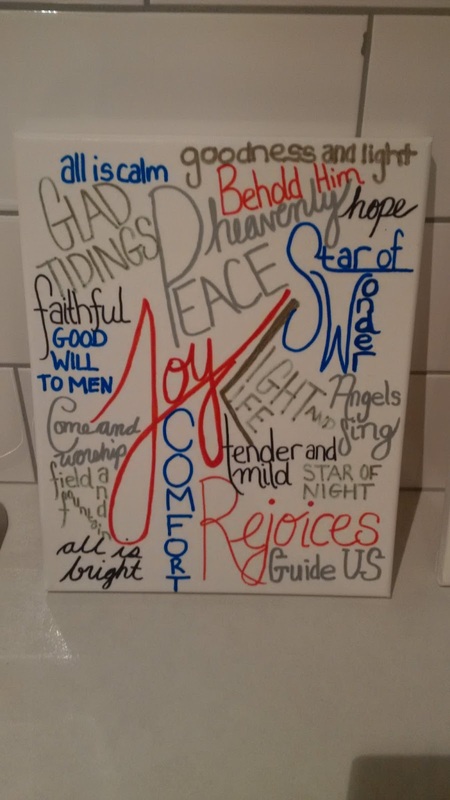 Once I decided what I wanted the central words for this collage style canvas to be (Peace and Joy), I added them to the canvas. Then, slowly and carefully, I added all of the other lyrics from various carols that I wanted to include. Some of them had to be traced over several times. I did not do pencil underneath, again because if you are not doing a bold text it can be hard to cover it up. I did a few coats of Mod Podge over the top because I wanted a glossy finish and also to protect the canvas. This canvas did not go exactly as planned. WARNING: Mod Podge will make gold metallic Sharpie run and fade. It did not do this with any other Sharpies, but for some reason it did with the Gold Metallic. The original plan was just for the nice bright gold MERRY AND BRIGHT canvas. When you are doing bold letters with the Sharpie, instead of tracing outlines and colouring them in, you need to write a "thin" letter and then go over it repeatedly as you work to make it bigger and stop any bleeding edges. I used almost an entire Gold Metallic Sharpie to make this canvas. After going over it with a few layers of Mod Podge, the text started to blur and smudge. This made me sad. In the end, I could not salvage it so I decided to do a gold tissue paper overlay using the same technique as I did for the butterfly. I will be using this to make a Christmas display which I will share at a later date. These canvases will take more time than you anticipate. As with the journals, the most time will be sketching out and drafting your ideas.